When the Pro Bowl matchup between the NFC and AFC began in 1971, it featured a premier football game of the world’s best talent squaring off head-to-head. The Pro Bowl has gone through many changes, especially in the past few years, to try and make it more appealing to fans. The NFL ditched the classic NFC vs. AFC matchup from 2014-16, instilling a fantasy football-esque format where former NFL players served as team captains and picked their teams. In 2017, the NFL will go back to the classic AFC vs. NFC format, and it brought back the Skills Challenge to catch the eye of a broader audience. Who doesn’t like watching grown men pelt dodgeballs at one another like it’s fifth grade recess? Regardless of the bells and whistles to go along with the weekend, there’s still always a football game played. Although it seems to be a trend in Green Bay to save the best performances for the actual NFL season, which is probably for the best. Green Bay has been loaded with Pro Bowlers since 1990, specifically at the quarterback position. A Packer quarterback has been named to the Pro Bowl ten times in the last fifteen years. Aaron Rodgers has been named to six Pro Bowls, appearing in two. Brett Favre played in four Pro Bowls for Green Bay out of the nine times he was elected to the team while wearing green and gold. The past three Green Bay Packers players to throw a pass in the Pro Bowl are Rodgers, Favre, and Bubba Franks. No, that’s not a typo – Franks did in fact attempt a pass in the 2003 Pro Bowl. The previously mentioned Franks was named to three Pro Bowls in his nine-year career, and he caught two passes to go along with his one pass attempt. Green Bay has had 14 different players catch a pass in the Pro Bowl since 1971, although has had more than 66 yards receiving. John Kuhn’s 29-yard scamper in the 2015 Pro Bowl was the longest rushing attempt for a Packer Pro Bowl player since 1990. Ahman Green, named to four Pro Bowl rosters in his career, appeared three times and ran for a total of 65 yards. Perhaps no Packers player has had a better Pro Bowl than John Brockington in 1973. Although he ran for just 40 yards (the most for a Green Bay player in a single game, tied by Green in 2004), Brockington rushed for two touchdowns. And, if you noticed in the above chart, he also caught five passes for 57 yards and a TD. With three Pro Bowl appearances, Brockington and Green tied for the most for a running back in team history (since the 1971 AFL-NFL merger). 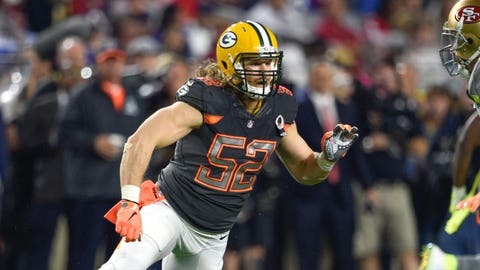 For a complete list of Packers who made the Pro Bowl — including offensive linemen, defensive players and kickers, please check out this list from Packers.com.